Convention bureaus are specialists in matching meetings to the distinct resources of Alabama’s four largest cities. Attracting conference organizers to Alabama is a constant courtship by Convention and Visitors’ groups across the state, which tout attractions and calculate benefits to add to the allure of the city. With big bureaus like Birmingham, Huntsville, Mobile and Montgomery, the challenge is for a city to find its way to the planner’s shortlist, and then these regions of Alabama showcase their unique appeal to close the deals. 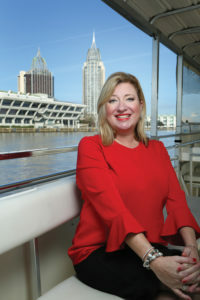 In Mobile, the enticement of a coastal venue makes the city an easy sell once planners are privy to its myriad attractions and the efforts the CVB staff make to accommodate needs, says Amy Angermeier, vice president of sales, Mobile Convention and Visitors Bureau, part of the city’s Visit Mobile. To highlight Mobile’s desirability, the CVB offers incentives — travel help for planners, perhaps a donation to a charity that a visiting group supports or VIP tickets to attractions. Sites like USS Alabama Battleship Memorial Park are available for planners to tour, as well as outings on the Robert Trent Jones Golf Trail. Visit Mobile also offers monetary incentives based on specific room nights booked and exhibit space, and the organization throws the weight of its marketing support behind conferences with social media support and website links. To make an event memorable, the city can call on its Azalea Trail Maids or the Battleship’s Ship Mate Crew to welcome and guide guests. While the conventional path is a reception at the hotel, some groups prefer unique settings for luncheons and outings, such as the battleship, the golf course, GulfQuest National Maritime Museum of the Gulf of Mexico and The Steeple on St. Francis, a century-old church refurbished as an entertainment venue. “Depending on the time of year, we always let them know the convention center is on the water, and it’s beautiful to hold a meeting overlooking the bay,” Angermeier says. Conference planners can rent a boat to offer attendees a break from meetings. Like other CVBs, Visit Mobile holds sales blitzes throughout the country with Professional Convention Management Association and Meeting Professionals International, organizations active with meeting planners. Keely Smith, director of sales at the Montgomery Area Chamber of Commerce Convention and Visitor Bureau, says incentives vary depending on the size of a group, among other factors. “If a group has 1,000 total room nights, we would look at ways we could help pay for some of their costs at the convention center or full-service hotels,” Smith says. Smith and members of her team gather meeting specs, get options from hotels and share that plus more about Montgomery with meeting planners. The Legacy Museum and The National Memorial for Peace and Justice, which opened in April 2018, is becoming an increasingly popular attraction for the capital city. “You can walk through eight acres of beautiful landscape to experience a memorial to those who lost their lives,” Smith says. Alley Station, in the heart of Montgomery, has ballroom space to accommodate 300, a rooftop venue to accommodate 200 and revamped warehouse space to accommodate 330. The rooftop terrace epitomizes the CVB’s catch phrase of “Capital Cool” with open-air space bringing a modern feel. Central, 129 Coosa, a renovated 1895 grocery warehouse, overlooks the Alley entertainment district, offering reception and meeting space. Smith says the cuisine is one of the city’s important attractions. “We have diverse cuisine, and when we bring planners in, one thing they comment about is how much they eat and how great the food is,” Smith says. Michael Gunn, senior vice president of sales for the Greater Birmingham Convention and Visitors Bureau, is equally passionate about what Birmingham has to offer. The Magic City’s CVB is an economic development arm of Birmingham, and Gunn considers his mission to go forth and find organizations to bring back home. When event planners express interest, the CVB brings them in to tour attractions and experience restaurants. Gunn likes to show off Birmingham’s unique attractions, including Barber Motorsports and Museum, the Civil Rights Institute, the Birmingham Botanical Gardens, Vulcan Park, Sloss Furnaces National Historic Landmark and more. Gunn has lived in the Birmingham area for 20 years and loves giving people a new perspective on a city they might have had preconceived ideas about. Gunn is particularly proud of the food scene and award-winning chefs Frank Stitt, Chris Hastings and others who make Birmingham a favorite among foodies. Gunn likes to point out unique appeals like the largest Wedgwood collection in the world at the Birmingham Museum of Art, the sports medicine scene that brings famous athletes to the city for treatment and the convenience to airports and interstates. And for millennials, the city offers breweries, clubs and more. “This is a happening place for them,” says Gunn. Visit Huntsville and you can dine under a Saturn V moon rocket at the U.S. Space & Rocket Center to be sure. But the city has much more to offer than just its space history, says Jamie Koshofer, vice president of conventions at the Huntsville/Madison County Convention and Visitors Bureau. Koshofer says a group of 6,500 can take over the whole city, giving convention-goers their own community. The city is also adding to its inventory. Downtown will include 106 Jefferson Hotel, a Curio Collection by Hilton, offering easy access to Huntsville highlights such as The Garage at Clinton Row retail center, The Avenue shops, Big Spring Park, CityCentre at Big Spring, Von Braun Civic Center and the Huntsville Museum of Art. The Von Braun center is currently renovating and expanding, adding a music hall and additional meeting space, including a new 35,000-square-foot ballroom and 14,000 feet of breakout meeting space. “We have a renaissance happening in the downtown area with restaurants, shops and bars coming to the area,” he says. “If you don’t want to stay downtown, we have two great hotels right next to the space and rocket center. The Westin at Bridge Street Town Centre, an upscale shopping center at Cummings Research Park, includes an outdoor shopping and entertainment area. Abundant off-site locations include Camps No. 805, a former school that houses two craft breweries, shops and restaurants. Lowe Mill Arts and Entertainment Center is an art studio complex, one of the largest privately owned arts facilities in the U.S., including working studios, performance venues and more than 200 artists. Cara Clark and Mike Kittrell are freelance contributors to Business Alabama. She is based in Birmingham and he in Mobile.